Stamps Health Services began to see patients experiencing gastrointestinal illness (infection affecting the stomach and/or intestines) and symptoms of nausea, vomiting, and diarrhea beginning the week of February 8th. Working with the Georgia Department of Public Health, samples were sent for testing and identified norovirus to be the cause of illness spreading on campus on March 6th. Norovirus is a highly contagious virus that is commonly referred to as the “stomach bug” that causes your stomach and/or intestines to get inflamed. Dining Services, Housing, and the Student Center began enhanced cleaning procedures in late February when norovirus was suspected to help prevent additional spread on campus. Stamps Health Services has already seen a decline in patients presenting with symptoms. However, norovirus can continue to circulate on college campuses for weeks to months if proper steps are not taken to prevent spread. Preventing the spread of norovirus at Georgia Tech is everyone’s responsibility. Proper hand hygiene, in addition to maintaining good personal hygiene, is essential for preventing the spread of norovirus. Wash your hands thoroughly with soap and water especially after using the toilet and always before eating, preparing or handling food. Stay home if you are sick. Stay home until you are symptom-free for at least 48 hours. Symptoms typically last 12 to 36 hours. Wash hands thoroughly with soap and water for 20 seconds, whether you are sick or not. Alcohol-based hand sanitizers can be used in addition to hand washing, but they are not a substitute for washing with soap and water. Hand sanitizers do not work well against norovirus. Do not share food, drinks, eating utensils, or drink containers. Disinfect common surfaces with a bleach-based cleaning solution. Norovirus can live on hard surfaces, objects, and clothes and cause illness for days to weeks. Wash dirty laundry on longest wash cycle and machine dry. If you are sick, get plenty of rest and stay hydrated – both water and sports drinks can help, avoid caffeine and alcohol. Properly wash and prepare food. Wash fruits and vegetables thoroughly, throw out any food that might be contaminated with norovirus through being prepared or eaten by someone who is sick, and, if you are sick, do not prepare food for others until you have been symptom free for a week. If you are currently experiencing symptoms and dehydration is a concern, contact Stamps Health Services for an appointment (404-894-1420). 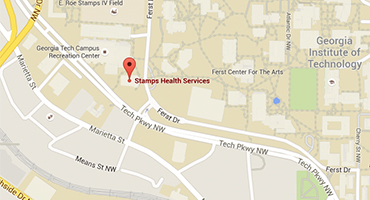 Follow Stamps Health Services on Facebook future information related to this, if neccessary, and other contagious illnesses spreading on campus.